Politician though he is, this fellow is refreshingly direct. I understood every word he said! Chris and I attended Pete Wernick’s Merlefest Jam Camp last week, our seventh camp in Wilkesboro and eight overall (we also attended one in Morehead, Ky. back in 2003). People sometime ask us why we continue to attend, i.e. don’t we know how to jam yet? Pete is also puzzled sometimes about why people return, since each camp covers roughly the same ground. But return they do—at each camp about half the attendees are repeat students. For us, the answer is simple: we continue to attend because we continue to benefit. At our first three Merlefest camps (2003-2005) Chris played a different instrument each time, guitar, then bluegrass banjo, then fiddle. We skipped 2006, but in 2007 Pete moved the camp to a very nice YMCA facility just outside of town, and added an intermediate track—that was enough to lure us back. And by then we realized that, even though we didn’t know in advance exactly how attending the camp would bless us, it always did. If nothing else, we had the opportunity to watch a master teacher at work, and Pete never teaches the material the same way twice. So now we automatically sign up, knowing it will be worth our time. While at the camp Chris and I tried to be a help in any way we can. Mostly that meant working with those intermediate-level campers who want to work on their performing skills, rehearsing songs several times, working out harmonies and solos, identifying trouble spots and fixing them. We also offered an informal after-hours workshop on introductory stagecraft—how to stand at microphones, how to behave on stage, and so on. This was the second time we’ve tried that, and we wanted it to be hands-on, but both times the direction has veered off into a demonstration with the Ridgewood Boys performing abbreviated versions of songs to illustrate different points. We don’t mind that, but I don’t think it’s ideal, and we certainly don’t crave opportunities to show off. In any case, I hope it helped some of the campers to see that two students figured out how to give a credible performance by sticking with it for seven years. One treat for us this year was the after-hours jamming. Generally our participation in that is limited, because we’re tired after the day and have had our fill of the usual repertoire. But this year we gathered together with some friends who were also long-time attenders—Bob, Dan, and Tex—and the music ended up going places we rarely get to go, making it very satisfying and worth staying up late for. In case you haven’t heard, it’s been raining here in the mid-south. Yesterday the gauge said that twelve inches fell between 8am and midnight. The flooding was impressive, but for us it was mostly a headache because our house is well positioned on the hillside. The lower pasture flooded, so the cows spent the night in the barn. The water was flowing through the perimeter fencing and popped a couple of panels loose, but they are back in place now. The basement got damp but did not flood, and fans have dried the floor. The driveway was the worst, with depressingly deep gullies dug in it by flowing water, but this morning a neighbor came by with his tractor and graded it for us. In all this I use the term “we” loosely, because Chris and I were in Frankfort playing music when the floods came, and we were unable to get home last night due to water on the roads. Debbie and Maggie and Matthew were stuck with the job of keeping the homestead under control, which they did to the point of exhaustion; Chris and I sauntered in this morning to find everything mostly back to normal. We didn’t get any still photos of the flooding around the house. There is some video, which I may upload to YouTube at some point, but it won’t be interesting to most people. 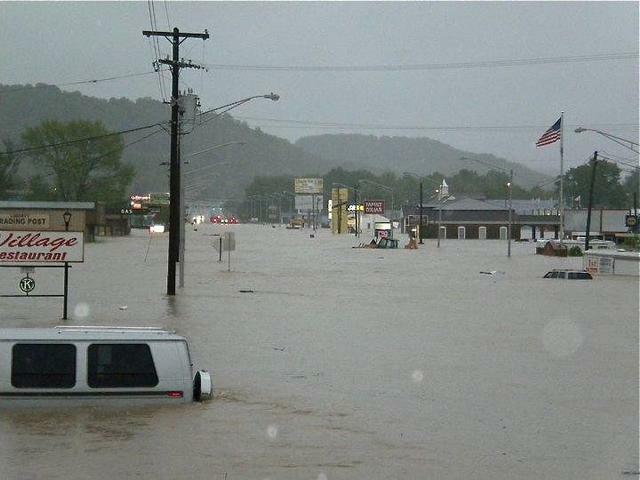 If you want to see some real flooding, take a look at these two Facebook photo albums. Liberty is a small town about fifteen minutes north of us, on US Hwy 127. Last night around 8pm we came south on 127 but were stopped about five miles north of town because of water across the road. We turned around and headed back to Danville, where we spent the night. This morning we drove south again to find that the water had receded and the roads were clear through Liberty and on towards home, but the damage done in Liberty was extensive. Look at some of those photos and you’ll see why. Here’s another photo of Liberty from a local online newspaper. This is the main drag, Hwy 127, the only road that could get us from Danville to home, taken about the time we were turning around. I’m glad we did.